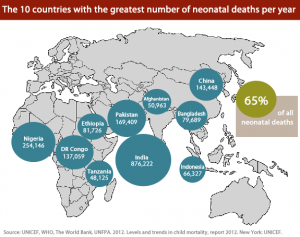 Did you know 2.9 million newborns die during their first month of life each year? To put it in perspective, this number makes up 44% of all child deaths. It doesn’t take an experienced statistician to see that if newborn mortality rates drop, childhood mortality rates will drop significantly as well. Piggybacking on the work which started last year starting with the Global Newborn Health Conference in Johannesburg last April, the Every Newborn Action Plan has been drafted to put newborn survival at the top of the world agenda. Today, February 25, 2014, Save the Children has just released their newest report on newborn health–sharing their findings about how people worldwide can join together to protect our youngest global citizens.